Despite the Nordic snap we have had this week, Germany is defiantly experiencing spring. After the months of averting my eyes from our messy and untidy garden in denial, my family and I finally plunged in armed with various garden sheers from Lidl and the guidance of my father-in-law. It’s now with pride that we have been enjoying the mature, landscaped garden that our house came with observing the unexpected budding and blooming from green spots. Our garden isn’t the only thing that’s been blooming. Earlier this month, I attended the second SCBWI Europolitan conference in Amsterdam, aptly called Creativity in Bloom: Growing Beyond Boundaries. The conference was over the Easter holiday (much to my chagrin in planning but something I quickly got over once I was there), and the Netherlands had planted the many bulbs they are known for. Tight tulips were coming through and were on the verge of exploding. Here is my tribe. I am no longer an island. The conference was so intimate that I could innocently ask agents, editors, creative director types if they were an illustrator or writer or both. Hee hee, but Martha Rago was so gracious and sweet about it. The people in this industry are so nice and interesting. 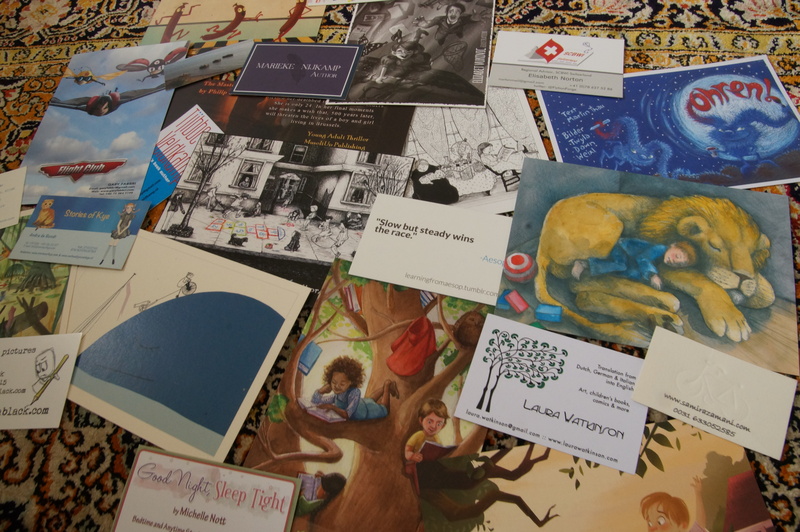 I mean, look at this picture of the business cards and illustrator postcards I collected. Diversity (the main theme of the conference) is like rhyming. Get it right or don’t do it at all. While reconnecting with Tracey Jaffart, another Germany-based American writer, we both realised: it might be torturing us, but we can’t ever stop writing now. I’m stuck in now. Agent Marietta Zacker talked about how she has a tendency of liking “quiet books” during her webinar in March yet she is the opposite of a quiet character! For this woman’s passion, humor and energy, I am grateful. If I can break through my plot hurdles in my manuscript, I believe in myself to get my book published. The question right now is if I believe in myself to fix my manuscript. This (conference, writing thing, life, etc) is so exhausting. Maybe I should declare that I’ve given it a go, but just stop and walk away from this children’s book writing thing for now. My SCBWI RA (Regional Advisor) is just like my college HA (Hall Advisor). I’m talking specifically about Patti Buff of Germany/Austria and Elisabeth Norton of Switzerland. Knowing that this was my first conference, Patti thoughtfully checked in on me on Sunday. There was a moment while answering her that I had to fan my eyes. Oh, my. The conference was so well-organised. I didn’t have to think about anything except for my craft and my journey. Infinite thanks to the conference host SCBWI Netherlands and Mina Witteman and number 10! I’m defiantly continuing on this roller coaster ride – that has a lot of long flat stretches as well as dips and climbs. I ran into fellow attendee illustrator Pia Drent on Sunday morning (shortly before number 10 above), and despite not having really talked directly to each other before then, we were both able to share our first-time-conference-going daze and slap of self-doubt in a quick exchange. Pia articulates her conference-attending journey beautifully here. During this conference I laughed, I cried. And indeed, it was better than Cats. Tags: Amsterdam, children's book writing, Europolitan, Europolitan 2015, Jane, Patti Buff, SCBWI, SCBWI German Austria. Bookmark the permalink.